The odds seem pretty stacked against big banks on multiple fronts as earnings season starts tomorrow. Making things even more challenging, many U.S. big banks enter Q1 reporting time facing tough comparisons to a year ago. The first results of all this turbulence land at Wall Street’s front door on Friday morning when JPMorgan Chase and Wells Fargo report Q1 earnings. Making things even more challenging, many U.S. big banks enter Q1 reporting time facing tough comparisons to a year ago and with less support from the 2017 U.S. tax reform legislation that gave many firms a boost early last year. The first results of all this turbulence land at Wall Street’s front door on Friday morning when JPMorgan Chase (JPM) and Wells Fargo (WFC) report Q1 earnings before the opening bell. Citigroup (C) steps to the plate Monday morning. Other big banks also report next week. JPMorgan, Wells Fargo, and Citigroup are all expected to report slight drops in revenue from a year ago, according to third-party consensus estimates (see more below). Earnings per share also are expected to be down a touch for JPMorgan in Q1, analysts said. Bank stocks trail the S&P 500 (SPX) in performance so far this year (see chart below). A common investor misconception is to think of the big U.S. banks as one entity responding to the same cues. While sometimes the bank stocks move in sync on news developments, it’s also important to distinguish them, because they’re not a solid bloc. For instance, falling mortgage levels probably mean more for Wells Fargo than the other banks reporting Friday and Monday, because WFC has a huge retail mortgage business. Meanwhile, the global stock trading environment — which might be a bit weak this year due in part to falling volatility — could pose a bigger risk to JPMorgan Chase with its huge trading business. If the economy is weakening, that could hurt Citigroup with its credit card exposure. The investment banking businesses at JPM and WFC will probably get a close look from investors amid market talk that trading has been subdued in the Q1 vs. a year ago, when volatility was elevated. The first quarter this year featured a government shutdown, followed by a Fed pivot that pretty much killed volatility, Briefing.com noted. That might have worked against banks from a trading standpoint. Recent stock market volume has been pretty thin. Also, Briefing.com said the market closed last year in a tailspin, which might have sent some traders and investors to the sidelines. With the Securities & Exchange Commission (SEC) closed for part of Q1 due to the government shutdown, that might have hurt the underwriting business for banks, though initial public offerings (IPOs) did start to pick up by the end of Q1. At the same time, the China tariff battle, Brexit, and the inversion of the yield curve in late March all might have caused uncertainty in the business world, perhaps limiting the market for banks’ services. How all this plays out in earnings will soon become clear. Meanwhile, mortgage rates have fallen significantly from recent highs near 5%, with average 30-year mortgages at around 4.3%, according to BankRate.com. While it’s possible that lower rates might be giving the moribund housing market a little new life in quarters to come — which could potentially help lenders — the lower rates also might eat into some of the big banks’ profit margins. Just a year ago, rates were on the rise and there was a lot of hope for an improved mortgage business. It might be interesting to hear what WFC executives have to say on this topic. Speaking of WFC executives, the company recently announced the retirement of CEO Tim Sloan. There’s a lot of debate right now in the financial world about who WFC should consider as a replacement, especially since the bank said it wants to hire an outsider. Sometimes that can cause uncertainty, because historically the big banks have tended to elevate insiders to the top position. Perhaps we can get more clarity about the situation on WFC’s earnings call tomorrow. The other thing that investors might want to stay tuned for, especially on Friday, is what bank CEOs have to say about the economy in general. JPMorgan’s Jamie Dimon is one financial leader whose comments often get a close read on earnings day, so we’ll wait and hear if he has anything to say about how he sees fundamentals shaping up in coming months. When JPMorgan Chase releases results, it's expected to report adjusted EPS of $2.35, vs. $2.37 in the prior-year quarter, on revenue of $28.47 billion, according to third-party consensus analyst estimates. Revenue is expected to fall 0.2% year-over-year. Options traders have priced in about a 2% (about $2) stock move in either direction around the upcoming earnings release, according to the Market Maker Move indicator on the thinkorswim platform from TD Ameritrade. Implied volatility was at the 22nd percentile as of this morning. Weekly call options have been active at the 105, 108 and 109 strikes, and put activity has been concentrated at the 97 and 103 strikes. Wells Fargo is expected to report adjusted EPS of $1.10, vs. $0.96 in the prior-year quarter, on revenue of $20.99 billion, according to third-party consensus analyst estimates. Revenue is expected to be down 4.3% year-over-year. Options traders have priced in a 2.5% ($1.23) stock move in either direction around the coming earnings release, according to the Market Maker Move indicator on the thinkorswim platform. Implied volatility was at the 28th percentile as of this morning. Weekly put activity has been higher in the 46-strike puts, while call activity has been active at the 49 and 50-strike calls. Citigroup is expected to report adjusted EPS of $1.80, vs. $1.68 in the prior-year quarter, on revenue of $18.65 billion, according to third-party consensus analyst estimates. Revenue is expected to be down 1.2% year-over-year. Options traders have priced in a close to 3% ($1.95) stock move in either direction around the coming earnings release, according to the Market Maker Move indicator on the thinkorswim platform. Implied volatility was at the 30th percentile as of this morning. Call activity for C has been higher in the 65, 67.5 and 70 areas, while put focus has been active from the 65 through 62.5 strikes. 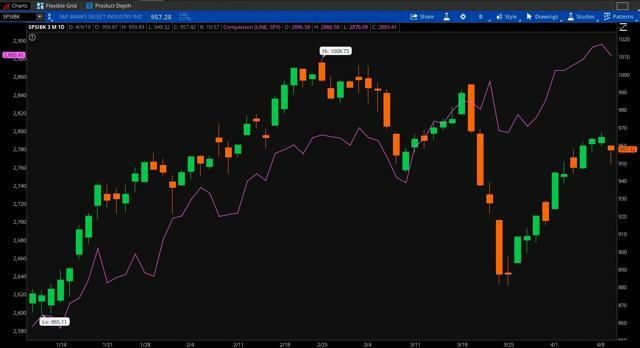 Banks behind: As this year-to-date chart shows, bank stocks (candlestick) are trailing the S&P 500 (purple line) so far this year, though they made a significant comeback over the last two weeks after heavy selling around the Fed meeting in late March. Data source: S&P Dow Jones Indices. Chart source: The thinkorswim platform from TD Ameritrade. For illustrative purposes only. Past performance does not guarantee future results.